I strongly agreed with the overall analysis in Yossi Mann's article, "Can Saudi Arabia Feed Its People?" (Spring 2015), but I must cite one background dynamic that is unacknowledged in the choices initially made by the regime. Among my graduate students in the 1990s in the international studies program were the twin sons of Prince Turki-Faisal. The young princes, both air force pilots who participated in the aerial combat with Iranian pilots over the Persian Gulf, were quite mature and capable in many academic and non-academic respects. In a lecture to a seminar, I discussed the availability of grains, wheat particularly, in the world marketplace. At the time, Canada's surplus crop had been bought up by China; the small surpluses in places such as France and Argentina had quickly disappeared from the world market, making the United States the only possible source of any surplus for the world at large. The Soviet Union happily bought most of the U.S. crop. As a result, Washington was in a dilemma with a very limited surplus available for export to meet an existing high demand and had to prioritize to whom to sell or distribute the limited supplies. The young princes approached me privately after my presentation to discuss the ramifications of this dilemma. They put it to me succinctly, "Of course, the close alliance of our two countries certainly means Saudi Arabia would be given a priority status in the distributive decision process." They mentioned that the Saudi government had granted Washington permission to build and maintain twenty-seven military bases and installations (including missile sites pointed at Saddam Hussein's Iraq) on their territory for joint or exclusive U.S. use. Two days later, the young princes brought up the subject again. They said they called their father the previous evening, laying out the specifics of my seminar data and the predicament. 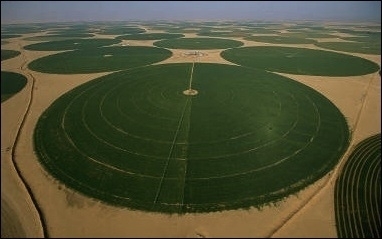 He agreed that the Saudi government would have to adopt a vigorous grain-growing program. In a subsequent discussion with the young princes, I made the same point as Mann does: The cost of producing wheat per acre was exorbitant; it was cheaper to buy on the world market, and the immediate situation would likely change for the better. However, Prince Turki and others felt it was critical to develop a strategic reserve from their own sources and avoid a dangerous vulnerability as the prince and the princes conveyed to me. Related Topics: Saudi Arabia | Summer 2015 MEQ receive the latest by email: subscribe to the free mef mailing list This text may be reposted or forwarded so long as it is presented as an integral whole with complete and accurate information provided about its author, date, place of publication, and original URL.